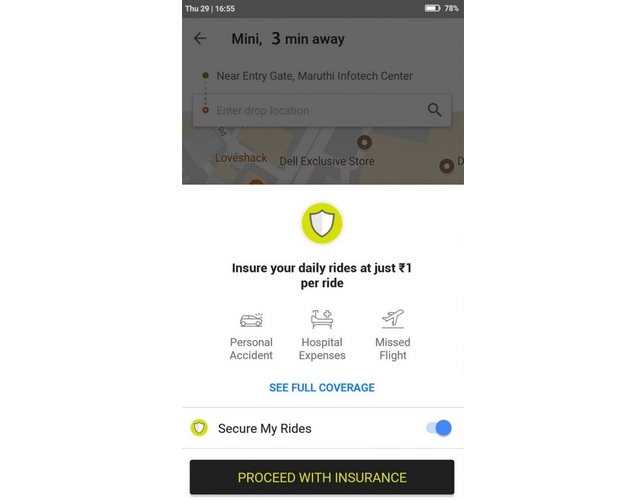 Ola has taken a step into the insurance services today with the launch of in-trip cover for customers to mitigate losses that they may incur due to cab-related incidents. Ola says the new cover would be ideal for missed flights, accidental medical expense, loss of goods, and a host of other mishaps. “We are thrilled to introduce in-trip insurance for our customers under the ‘Chalo Befikar’ insurance program. Just for INR 1, Ola customers can avail an insurance policy of INR 5 lakh which will also provide cover for missed flights, loss of baggage, loss of laptop, emergency hotel requirements, and many more”, said Ola’s CEO Vishal Kaul regarding the new program. Ola’s customer insurance plan will be valid for all ride options such as cabs, autos, and e-rickshaws and possibly any public transport vehicles it operates in the future. It will be piloted to customers in over 110 Indian cities and Ola collaborated with Acko General Insurance for claims fulfilment, and will soon finalize a deal with ICICI Lombard General Insurance, it says. As for the charges, customers can avail Ola’s in-trip insurance plan by booking their ride at a premium of ₹1 for travel within a city, while Ola Rental and Ola outstation services will cost an additional ₹10 and ₹15 respectively as insurance premium. In the first phase, the the insurance plan will be rolled out in metros, and will gradually be made available in all the target regions across the country. The in-trip insurance plans will be listed for purchase in the Ola app, while claims can also be made from within the app, or by contacting Acko General Insurance.